The TSP series Trash self-priming sewage pump is a new generation product developed by the latest technology of Domestic and foreign. The pump is single-stage, single-suction, horizontal, application for gas-liquid mixture. The rear pull structure eliminates the need to remove the pump body and piping. The TSP series of self-priming pumps are specifically designed to handle solids-containing liquids for economical and trouble-free operation. 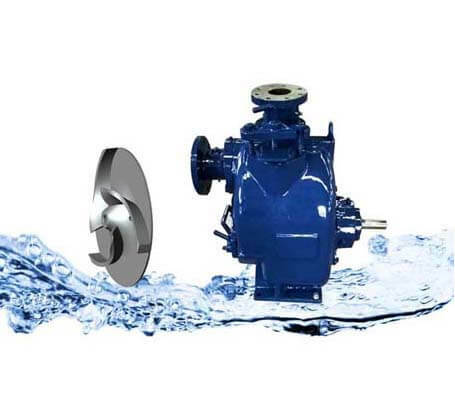 The pump features anti-blocking, No winding, and strong sewage pass through ability. The front sealing plate of the pump is designed with a removable and clear-up hole structure to ensure quick and timely removal of strong dirt. Municipal sewage, environmental protection engineering, petroleum, chemical, pharmaceutical, printing and dyeing, electroplating, fire protection, domestic water supply, factories, mining, agriculture, flower gardens, water reservoir, food, brewing industry, etc. One-time irrigation, lifetime use: just fill the pump cavity through the irrigation hole before the first run, no need to refill after starting. The semi-open non-blocking impeller with hydraulic optimization design can pass the larger size solids and has strong sewage capacity. The connection mode of the threaded pipe without bolts greatly reduces the installation time. 4, self-priming ability: Nearly impossible sealing gap, to ensure that the self-priming height reaches nearly 8m, while running high speed, greatly shortening the self-priming time. 5, easy external adjustment: even if the gap between the impeller and the front sealing plate is increased, it can be easily adjusted by the outside to ensure stable self-suction height and performance.